Before we start getting serious let's look at something fun shall we? After all what would life be without indulgences, and just because you're eating Paleo doesn't mean you can't enjoy yourself. One of the nice things about Paleo eating is that things that are eaten too often in the regular SAD diet (Standard American Diet) are a special treat for us. This allows us to savour them, and also to concentrate on quality not volume. This Valentine's day is the perfect time to do both. I'm talking about a small investment of both money and time here. Buy organic strawberries. Not only are they one of those fruits that get the most pesticides, but the taste difference between average and organic is like night and day. 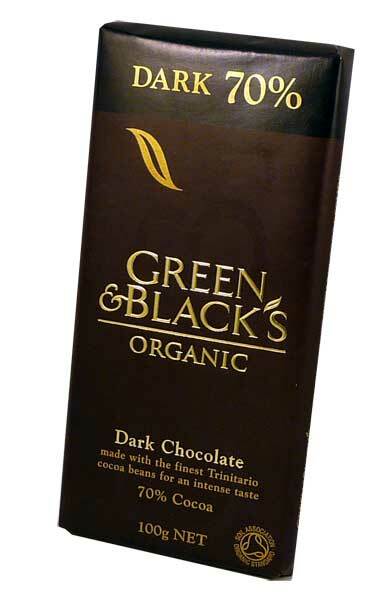 This is also the time to invest in good quality dark chocolate. You are, after all, only using a small amount. My favourite is Green and Black's 70%, but there are also many other wonderful bars out there. Total expenditure for this luxury? Under $10 dollars. 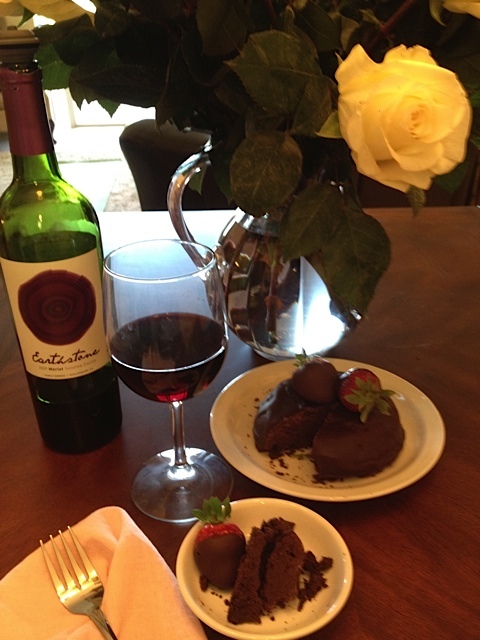 These two items by themselves are delicious and, with the proper presentation, nobody will complain being faced with this alone for dessert, but Valentine's day is the perfect excuse to Wow, and why not, when you can do it so easily? So here are three options. I would serve all of these with a delicious glass of red Merlot, but it isn't a necessity by any means. Everything will taste great without it. Note : Some of these ingredients are not strictly Paleo, but most would agree they can be used in moderation on special occasions. Wash and dry strawberries. Place in a bowl. Put about half a cup of sour cream in a smaller bowl. Put about the same amount of maple or coconut sugar or syrup in another small bowl. 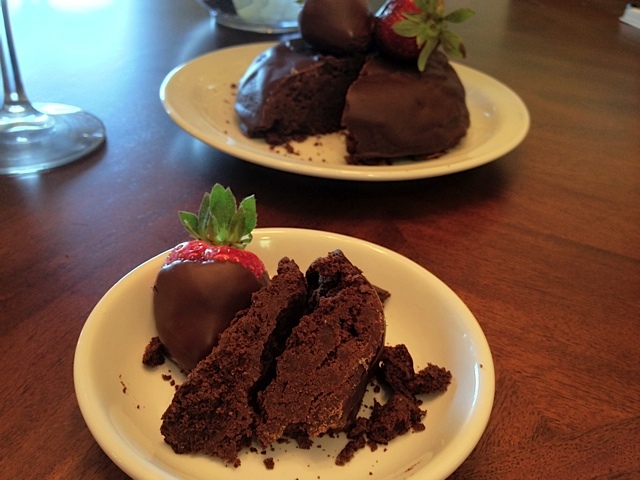 Break up the chocolate and place on a small saucer. Take it all to the table and enjoy. 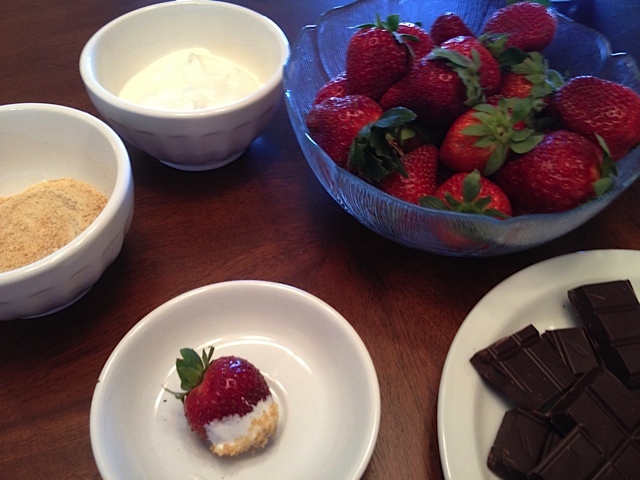 What you do is dip the strawberries first into the the sour cream and then into the sugar (or if using syrup reverse the order.) Nibble on a piece of chocolate. Sip wine. Could anything be easier and still be so decadent? Wash and let strawberries dry by putting them on a few pieces of paper towel or a clean kitchen cloth. Place a piece of parchment paper or wax paper on a large plate. Make sure there is room for this plate in your fridge. I use a small cutting board as I find it fits easier into my fridge. 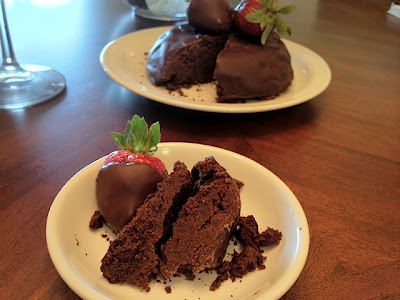 In a small bowl, break up the chocolate and melt in the microwave. Start with 2 minutes. Take out and mix with a spoon. Add another minute. Take out and mix. Continue until only a couple of pieces are still unmelted. Continue mixing until all the chocolate melts and the mixture is smooth. Take each strawberry and dip into the chocolate. Place on the prepared plate or board. Refrigerate. When the chocolate has hardened these babies are ready. Remove from the fridge, place on a clean plate. Serve and enjoy the look of amazement on your partner's face. Note : I was just at Whole Foods this morning. 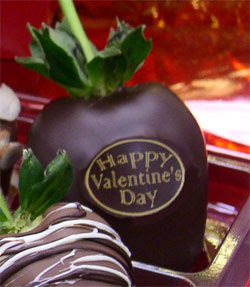 They are selling chocolate covered strawberries for Valentine's day .... for $5 for 2 strawberries! Option # 3 : Still Quick and Pretty Easy ... but with that extra WOW ! This option is the most time consuming - if you count 20 minutes as time consuming. And that's 20 minutes counting cooking time to make and ice a delicious chocolate torte. Don't believe me? It's easy ... when you use the microwave! Place the butter in a coffee mug and melt in the microwave for 1 minute. Use about 1/4 a teaspoon of the melted butter to grease a small soup bowl. This is your cooking pan and you want the cake to come out easily so grease it well. Use a pastry brush or just a piece of paper towel. Mix in the cocoa powder and almond flour with the rest of the melted butter. (I use a fork ) Add maple syrup and vanilla and mix again until combined. Add the eggs to your cake mixture and mix until smooth. Pour into your prepared cooking bowl. Remove carefully. The bowl will be hot so use oven gloves or at least a towel. To remove the cake, place a small plate on top of the bowl. Invert. Remove bowl. Because you greased the bowl it should come out clean, but if it doesn't don't worry. If there is still some stuck to the bottom scrap it off and put it on the top. You can always use some of the icing as glue. That's what happened to me but it still looks good doesn't it? Leave the cake until completely cool. I would make it the night before and finish it before dinner. Meanwhile get your serving plate ready. Cut two pieces of wax paper and place on the plate next to each other and slightly overlapping, then place your cooled cake on top. This keeps your plate clean while you're icing the cake. 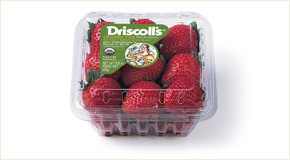 While you're at it, cut a small piece of wax paper for your strawberries. Dip the strawberries into the chocolate. Place on the wax paper until you're ready to use them. Pour the chocolate over the cake. Using a knife spread evenly, make sure all the sides are covered. Now gently pull out the wax paper from under the cake and voila - you have a nice clean plate with no drips! Top with your prepared strawberries, place the cake in the fridge, and leave until the chocolate is hard. ( will freeze ) but without the berries. Looking back, I know there seem to be a lot of directions, but that's only because I wanted everyone - even a novice - to be able to do this easily. I could just have said "mix all the ingredients, microwave for 4 minutes, cool, and ice with melted chocolate" - and next time you do this it will be that easy. This is not only a spectacular but also a very decadent-tasting dessert. When cold from the fridge it tastes like the best kind of brownie and believe me, though it looks small, you will find a quarter of this cake is more than enough for each person. 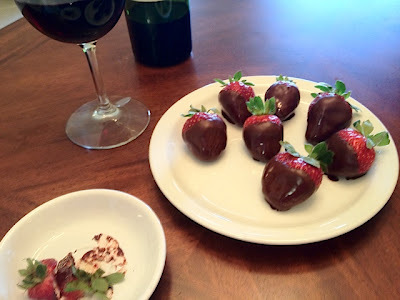 Of course I've written this for two since it's Valentine's day, but if you want you can always cover two more strawberries with chocolate and serve it to four. Please try one of the above ideas tomorrow. Whether you celebrate it with your family, friends, or a special someone ... I hope you have a wonderful Valentine's Day!